The Challenge Paddy Wagon creates a high production padding station that is easy to use, portable, and affordable. This machine is designed to eliminate the mess associated with pad production while saving money and time. This padding press can set up to 15,000 sheets of paper at once. 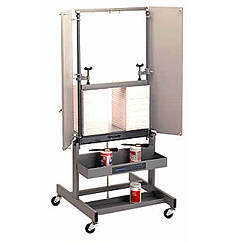 The integral shelves store padding equipment and catch the excess padding compound. The table edge and clamping bar are designed to reduce compound buildup. The excess compound is easily removed with your padding knife. When you are done with the machine all you have to is simply roll the machine aside until the next time you need it. If you have any questions or are interested in purchasing the Challenge Paddy Wagon, visit us at SpiralBinding.com. We have great pricing on a full line of Padding Machines. Call us at 1-800-631-3572 for more information!